The following comments about attractions in Banten have been posted from individuals. We believe that the best reviews of Banten, Indonesia are written by travellers and holiday makers who have experienced Banten first hand and want to share their thoughts. Can you share yours? Please help us expand this section of our Banten World Guide. Let us know what you think about the attractions in Banten, Indonesia. 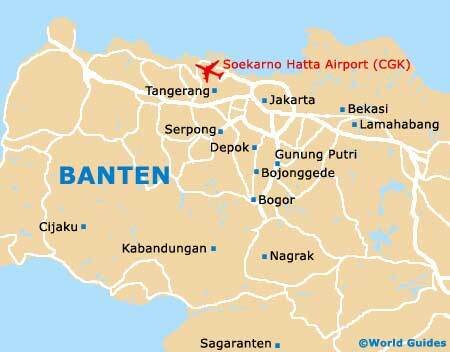 Submit comments about Banten attractions here. There are always more people at Carita Beach I think. You should try that one, it's the most popular by far. You can even take public transport there. I enjoyed Labuan Beach, it was my favourite in the whole of Indonesia even if it is little near to the city. Most people try and stop near here and hotels are often never fully-booked except around holidays. One thing I sometimes felt uncomfortable with was the lack of people there. I know some people like that though. You can head to Labuan Beach instead, it's not as busy. Or, try to head here during the week at the day time, when most people in Jakarta are stuck at work in the city. Holidays are always going to be busy! It was hard to get a spot on Carita Beach, on what was an incredibly hot day, but I'm definitely glad I made the effort. It's a favourite of Jakartans (if that's what you call the inhabitants of the capital) and sometimes I would have preferred somewhere a little more serene. No grumbles otherwise though, met some great people. Our access to Mount Karakatoa from the hotel that we booked was fantastic and I relished the chance to close and personal to a mountain I studied as a child at primary school. You can trek or hike alone but perhaps helps to get a guide or go with a tour group.